The alligator refused to leave for over two hours. They thought it was a burglar and all ran to hide -- before they realised it was a two-meter alligator that was banging at their door. The Polston family had fallen asleep for the night when Susie Polston was awoken by loud banging coming from their front door. Believing it was a burglar the family gathered and went to hide and call the police. A few minutes later the banging stopped and Susie's 16-year-old son crept to the door to take a look. “Oh my God, I found it! I found it!" 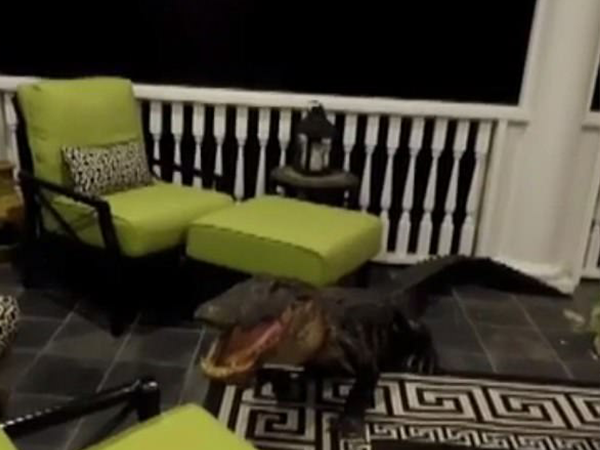 he shouted to the rest of the family, pointing out the 2-meter alligator that seemed to be desperately trying to get into their house. According to the Post and Courier, the animal had gone up the back stairwell to the second story porch of their home, crunched through the aluminum screen door and made itself at home between the sofa and a swinging bench. As the family waited for a local animal control company to arrive, the gator became increasingly aggressive. Authorities agent spent two hours trying to coax it out far enough from the porch to snare it safely. As Russell worked outside, the family inside dragged over household furniture to barricade the door. Apparently, alligators wandering up to homes isn’t unusual in the marshy area -- although climbing a story-high staircase is. But it’s spring, the time of year male gators roam for mates. The rambunctious chap eventually had to be euthanised. I'm a 65 year old man looking to meet women between the ages of 50 and 60. I'm a 23 year old woman looking to meet men between the ages of 25 and 45.